The Sears Craftsman Easy-Empty grass catching bag collects grass clippings for quick disposal without the extra work of raking. Any of the rear-discharge Craftsman walk-behind mowers—either powered or push models—include similar grass collection systems. Attaching the bag is fairly idiot-proof, because the bag won't mount on the mower unless the rear discharge door is pulled open. Emptying the bag can be awkward, however, since a full load of clippings may approach 40 lb. Choose a disposal area before mowing. If clippings go into plastic lawn-and-leaf bags, set the container of bags at the pickup point. If clippings become compost for the garden, choose a spot away from open windows. Grass clippings match cow manure in fertilizer quality and soon smell the same. Mow until the bag fills half or three-quarters full if a fully loaded bag weighs too much to handle safely. Walk power mowers back to the disposal area, following the same cutting path the machine already made so the mowing pattern isn't disrupted. 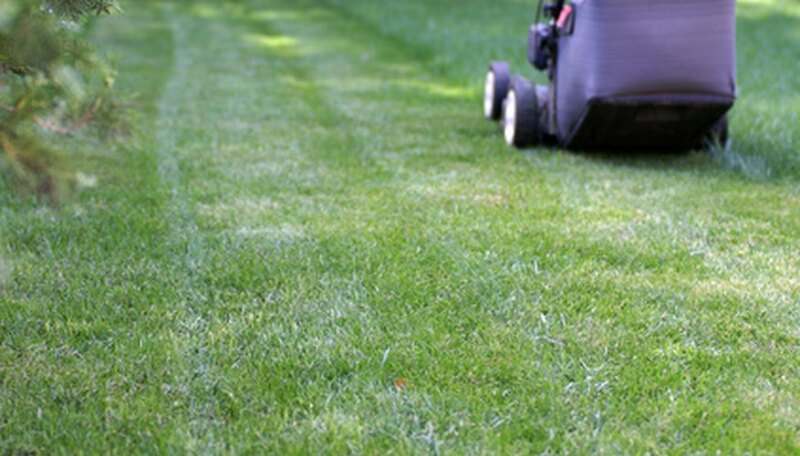 Stop the motor on push mowers while transporting clippings to the pile. Stop the mower by releasing the control bars and wait for the blades to stop turning. Don't disconnect the bag from the mower while the mower runs. Stand to the side of the bag and lift the discharge port door. The discharge panel hinged to the back of the motor housing drops over the top of the catcher bag in use and must be lifted to release the bag. Grasp the steel frame handle in the top center of the catcher bag with the other hand and lift the bag straight up and off the mower. Set the bag on the ground. Push the mower forward away from the bag. Hold the full bag by the handle and the rear part of the bag's metal frame. Tip the contents into a lawn-and-leaf trash bag or onto the compost heap. Lift the trap door at the back of the discharge chute and hook the frame of the bag back onto the mower just under the trap door hinge. The wire frame supports the bag and the trap door locks the bag in position. After mowing, empty the bag completely and use a garden hose to rinse it with plain water. Clean the bag thoroughly, first inside and then from the outside, to prevent grass clippings and sap from sealing the pores in the cloth. Unless air moves easily through the cloth, clippings will not flow efficiently into the catcher. Don't disconnect the bag and carry the full weight across the yard by hand. Use the mower to transport the load. Don't mount a wet bag to the mower. Set the bag aside to dry while in storage. James Young began writing in 1969 as a military journalist combat correspondent in Vietnam. Young's articles have been published in "Tai Chi Magazine," "Seattle Post-Intelligencer," Sonar 4 ezine, "Stars & Stripes" and "Fine Woodworking." He has worked as a foundryman, woodturner, electronics technician, herb farmer and woodcarver. Young graduated from North Seattle Community College with an associate degree in applied science and electronic technology. What Are Loaded Tractor Tires? How do I Troubleshoot When a Central Vacuum System Won't Shut Off?